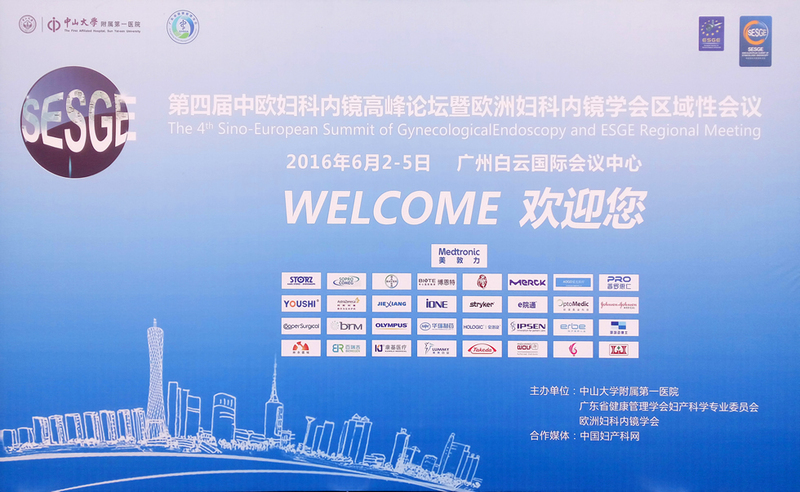 The 4th Sino-European Summit of Gynaecological Endoscopy and ESGE Regional Meeting has jointly sponsored by the First Affiliated Hospital, Sun Yat-sen University and Guangdong Health Management Association (GHMA) in Guangzhou Baiyun International Conference Center, 2 June to 5 June, 2016. This conference invited numerous of delegates such as prestigious experts, scientists and scholars to communicate and exchange academic lectures. It is a great honor for us to be here to get involve in this conference and offer high quality products and services to the guests. During this period of time, our excellent products and services not only praised by the guests, but we also had have a conversation with Shuzhong, Rao, the medical doctor, chief physician, and Ph.D tutor at the First Affiliated Hospital, Sun Yat-sen University. Mr Rao and the other experts praised our HD integrated imaging system. We promise our attitude to our user friends, we are strictly controlling the products quality, and moving forward to the advanced R&D. We believe that our professional and friendly image has been shaping between our team and users. Our South Zone sales manager, Mr Canchao, Chen, presented integrated imaging system to the guests. Our North Zone sales manager, Mr Chunlong, Yang, presented integrated imaging system to the guests.